Wall sawing is a critical step for opening a spot on a wall for a door, a window, or an HVAC unit. Wall sawing is a critical step for opening a spot on a wall for a door, a window, or an HVAC unit. Concrete and masonry are the two main materials you might have to saw through. What should you know about how to perform wall sawing, and what are some potential consequences? Here is how you can determine when to begin concrete wall sawing, and what to do once you get started. 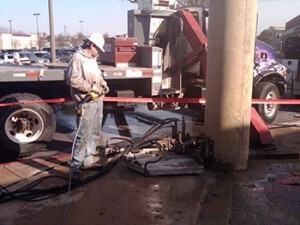 As great as concrete wall sawing is, it’s important to remember what could happen while this sawing is underway. Overcutting is one potential consequence. Overcutting happens when rounded blades are used to go around corners. However, the openings that are created can also be trimmed, and if the how the cut looks when it is finished doesn’t matter, then overcutting isn’t something to be concerned about. However, some openings just cannot have overcutting. One way to avoid overcutting is to attempt a different sawing technique. This entry was posted on Friday, July 14th, 2017	at 1:53 pm	. Both comments and pings are currently closed.